Moving can be very expensive, even if you try to do everything yourself. You still have to rent a truck, you have to pay for a lot of gas, and you have to bribe your friends with pizza and beer. If you hire a moving company in Phoenix – like you should – you’ll pay a lot more. No matter which option you choose, you’ll still end up paying a lot for deposits (for an apartment or for the utilities), for new furniture, and for a lot of other things you don’t realize you need until you move. Coming up with all that money at once can be hard for a lot of people, and not everyone plans their move. What do you do when you suddenly have to move and come up with thousands of dollars to cover everything? Using pawn loans strategically can be a wise choice that will get you the money you need without causing you more financial distress down the road. Pawn loans are available to people with all types of credit, and even those who have no credit history. That’s because they are awarded based on the collateral of the items you pawn. The security is built into the loan, so the Pheonix pawn shop doesn’t need to look at your credit. Many other unsecured loans are available to those with poor or no credit, including payday loans and title loans. However, these other unsecured loans typically have very high interest rates and terms that make them nearly impossible to pay back. Those who do manage to pay them back pay a hefty sum over what they originally borrowed. Pawn loans come with reasonable interest rates and terms so that borrowers can get the money they need and get back on their feet again quickly. Of course, you can outright sell your items to a pawn store instead of taking out a pawn loan. When you sell, you get the cash outright and don’t have to worry about paying it back with interest. At the same time, you would be clearing out items that you no longer need, which will reduce the amount you have to move, and would lower your overall moving expenses. That is – if you actually have items that you no longer want. It’s likely that if you are struggling for money, you don’t have a lot of unneeded items around the home. Therefore, you probably don’t want to sell the items and not get them back. By pawning them, you can tap into the value of the items you worked so hard to obtain, and you can retain them for future enjoyment. After your move, you may find that you have additional expenses that you didn’t expect. The new house might have a water heater that goes bad and needs to be replaced. The new apartment might spring a leak and damage your couch, but you didn’t have renter’s insurance to cover it. The utility bills might be much higher than you expected. When you choose to pawn rather than sell, you will have those items to pawn in Phoenix again and again to tap into the value whenever you need it. Musical instruments, TVs, cell phones, watches, computers, guns, and more can all be pawned again whenever you need the extra money. You can pay off the loan and then take out another. Or, if you find that you are struggling to pay back the loan because of other unexpected expenses, you can renew it. Pawn loans give you the flexibility you need to meet whatever financial demands arise. You can use them to cover your moving expenses or whatever else might arise after you get into your new home. 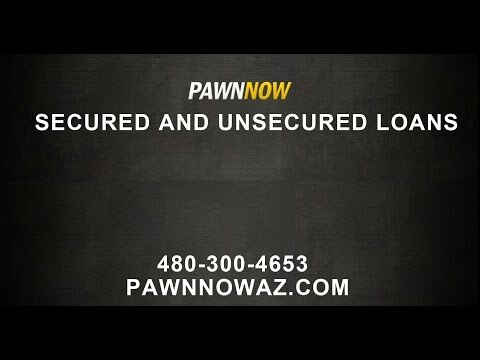 Pawn Now offers some of the best terms on pawn loans in Arizona. We have multiple locations throughout the state. Visit our Phoenix pawn stores to get a fast evaluation of your goods and an offer for a pawn loan, or find out how much you can get if you want to sell outright. In just a few minutes, you could have the cash you need in hand. Contact us today to learn more!